Interview with Ron Ueckert conducted March 2014. In 1976 guitarist Jim Lamb, and his longtime friend, drummer Dave "Duke" Arnold, were looking for a couple of other players to be in the club band at Jim's bar, The Old Miners Inn, in Creede. The duo recruited mutual friend and former Tennessee Hat Band and Tumbleweed keyboardist Sam Hendricks, and another local player, bassist Ron Ueckert. 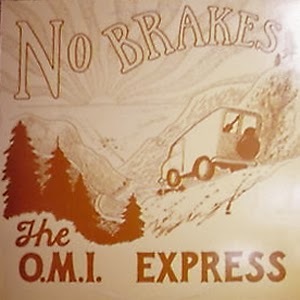 They called themselves OMI Express. After several years together, playing covers and some original songs, the band thought it was time to record an album. "A friend of ours, Bob Roberts, was working at the University of Texas, at their new recording studios," Ueckert said. "He invited us to come to Austin, for a trial run on the new equipment. It was during the Christmas break on the campus, so nobody was around when we recorded." Recorded in 1983, the session featured original songs, penned by Ueckert ("Don't Know Do You"), Hendricks ("Time"), and Lamb ("Rock &amp; Roll" and "Can't Change the Rules"). Listen to sample of "Can't Change the Rules"
As the band's live audiences back home favored the OMI Express flavor on cover songs, the band decided to add a couple, as well ("I Got a Line On You," and "Magic Carpet Ride"). Listen to a sample of "Magic Carpet Ride"
The round trip, made in the band's Ford van, became the inspiration for the LP's title. "Not only did we have several flats getting there and back, we also ran through a stop sign, because the brakes went out," Ueckert said. "It ended up costing us about $1100 to repair everything. We had no brakes." Returning to Creede, the band continued to play for several years until the original foursome lost two of its members, Sam Hendricks, and founder Jim Lamb. "Sam left to go back to Austin to get his doctorate in chemical engineering, and Jim took a job playing with David Allan Coe." Jimmy Lamb died in Alamosa, in 1989. He was only 40 years old. Ueckert re-formed OMI Express with Arnold, recording and releasing a cassette, Still the Boss. "It was our tribute to Jimmy," Ueckert said. A 1994 story in the Pueblo Chieftain noted a Lamb Jam Community Benefit Concert, including Tom Dessain, Bruised Bones, Laffing Buddha, The Feggarri Bros., Zoomin' Noomin', Tumbleweed and the OMI Express. Proceeds went to the Jimmy Lamb Memorial Fund which is given by the Creede Elks as a scholarship for a Creede High School senior. David “Duke” Arnold went on to play drums in the Gunnison bands Blue Moon, Hwy 149, and Sneakers. He passed away in 2008. That same year Ron Ueckert held a benefit concert for him at the Old Miners Inn, in Creede. Accompanying him were drummer George Egbert, saxophonist Rich Gallegos and guitarist Rob "Robear" Bosdorf. Sam Hendricks stayed in Austin, and is currently the keyboardist for Flounders without Eyes. Ron Ueckert has a carpentry business in South Fork, CO. He still occasionally plays around town.